The war came to an end on August 15, 1945. On September 8, the occupation forces of the Allied Powers rode in an endless string of jeeps, transport vehicles and tanks through Ginza, to the surprise of the people there. K. Hattori and the Matsuya department store, large buildings that survived the fires, were requisitioned as Post Exchanges (specialty shops for the US troops). 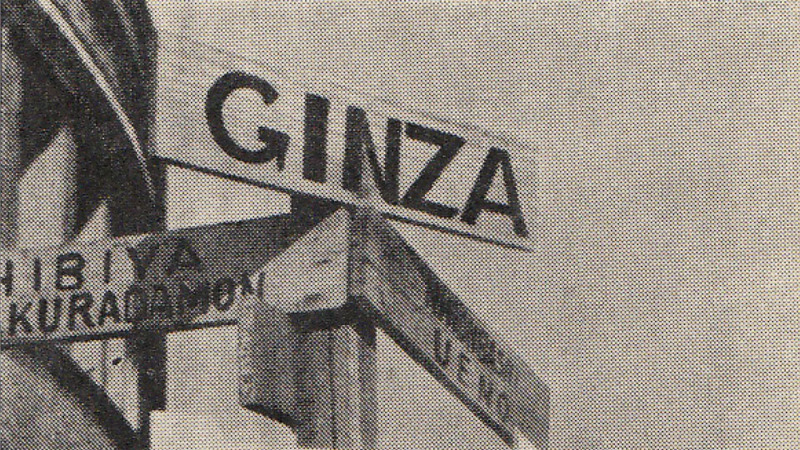 The occupation forces renamed the streets of Ginza with names they could easily understand and put up English street signs. The people working in Ginza’s shopping area were mired in confusion and set up their own reconstruction plans to protect Ginza from malicious illegal traders who tried to sneak their way in and to bring the bustling crowds back to the district as soon as possible. 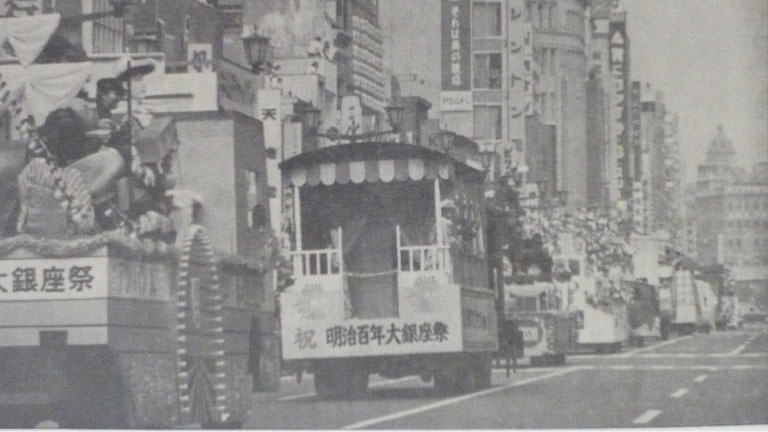 As early as April, 1946, they put on a Ginza Reconstruction Festival. It is said that 180 shops reopened on Ginza -dori during this festival. 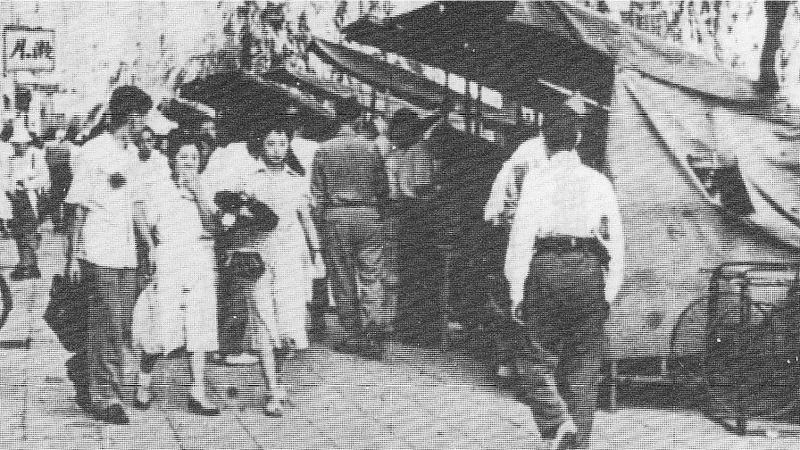 In addition to the regular shops, street stalls also lined up along Ginza -dori, selling souvenirs, clothing, food, children’s toys and other goods to the US troops. They lit acetylene electric lamps at night, creating a unique atmosphere. Although the street stalls played a significant role in the reconstruction of business in Ginza and many people remembered them as a feature of the district, they were ordered to be shut down by the GHQ (General Headquarters) in 1951 because of illegal business and unsanitary conditions. The San Francisco Peace Treaty was then signed, and in April, 1952, the following year, K. Hattori, Matsuya and other property was returned to Japan, finally setting off the start of full-scale recovery. While the burnt ruins of Ginza made a strong comeback through the efforts of its merchants, piles of wreckage remained here and there left behind by the air raids. It is said that the center median of Showa-dori was filled with endless mountains of wreckage. After puzzling over what to do with the wreckage, it was decided to use it to fill up the 50 meter wide moat that was already dirty and filled with masses of junk. Not only Ginza, but all the districts of Tokyo were waterfront districts or river transport districts, but the times changed, and the people of Tokyo were pushing hard to shift towards economic growth and vehicle-centered transportation. 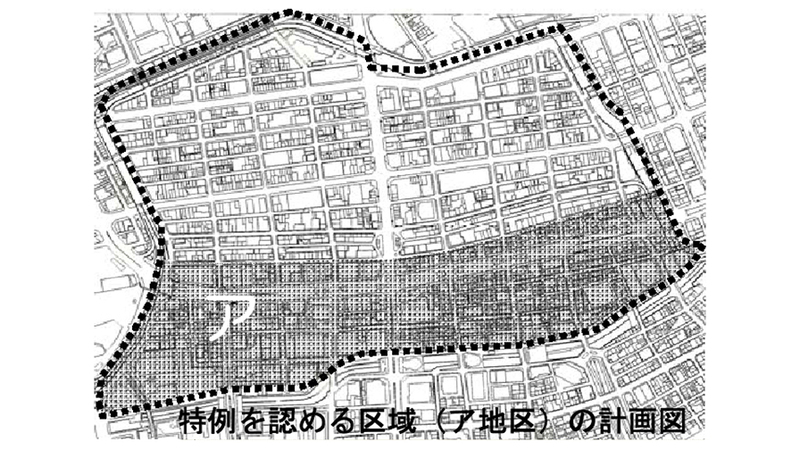 There were some people who opposed the filling of the moat in Ginza, but the opportunity was taken so far as to fill up all the rivers surrounding Ginza. Ginza went from being surrounded by rivers to being surrounded by expressways. The names of bridges remain today as the names of numerous intersections, including Kyobashi, Shimbashi, Sukiyabashi and Miharabashi. The vestiges of Hashizume Park that was located at the foot of a bridge provides one of the few green areas in Ginza. 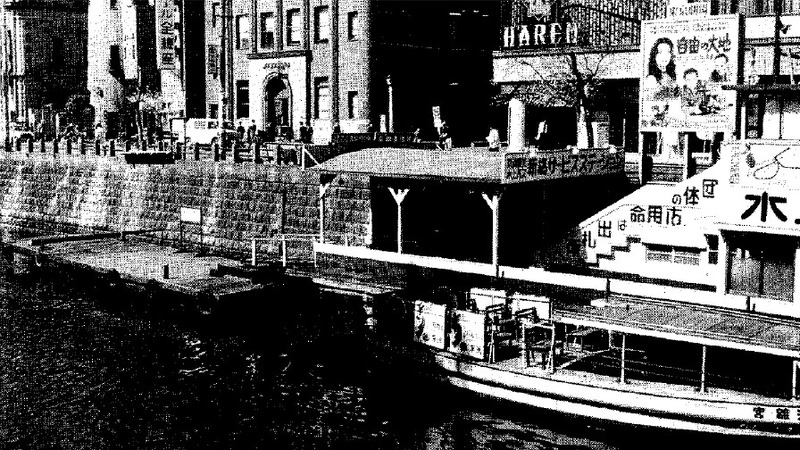 Around the mid-50′s, movies set in Ginza often featured water scenes, for example with a couple enjoying a boat ride after a date in Ginza. The radio drama, Kimi no na wa (“What is your name?”) that dominated the genre was also set on Sukiyabashi bridge crossing over the outer moat. The area from Kyobashi river to the outer moat and Shiodome river became a highway building owned by Japan’s only private expressway company with a road running over the roof of the shop building. A water-bus ran along Shiodome river. Near Ginza 8-Chome in 1959. Along with filling the outer moat, construction of new subway lines also progressed. Subway stations opened in Ginza one after another, with the Eidan Subway Marunouchi Line Nishi-Ginza (west Ginza) station (currently the Ginza station) completed in 1957, the Metropolitan Subway Asakusa Line Higashi-Ginza (east Ginza) station in 1963, and the Hibiya Line Ginza station in 1964. That was also the year that the subway section between Higashi-Ginza and Nishi-Ginza opened. 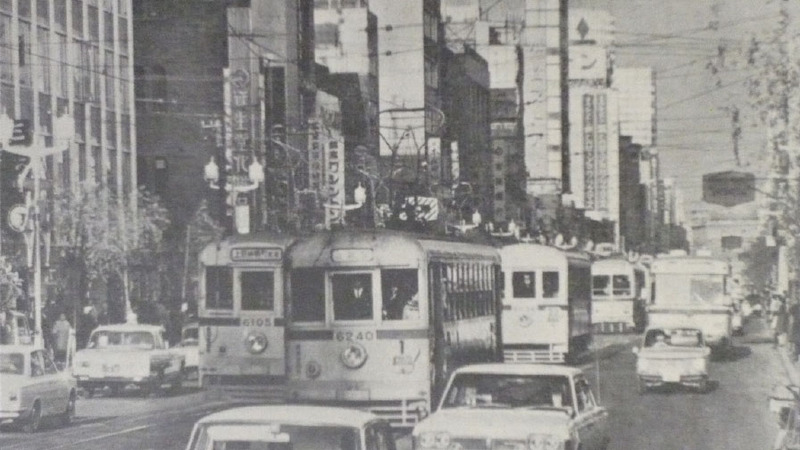 In 1967, the Toden streetcar Ginza line was finally shut down for good. Streetcar lines had crisscrossed Tokyo up until the mid-‘50s, acting as a valuable method of transportation. As motor traffic progressed and the number of automobiles on the roads increased, the trams ended up clogging traffic. The sight of trams running through Ginza -dori had already become a common feature of that area. 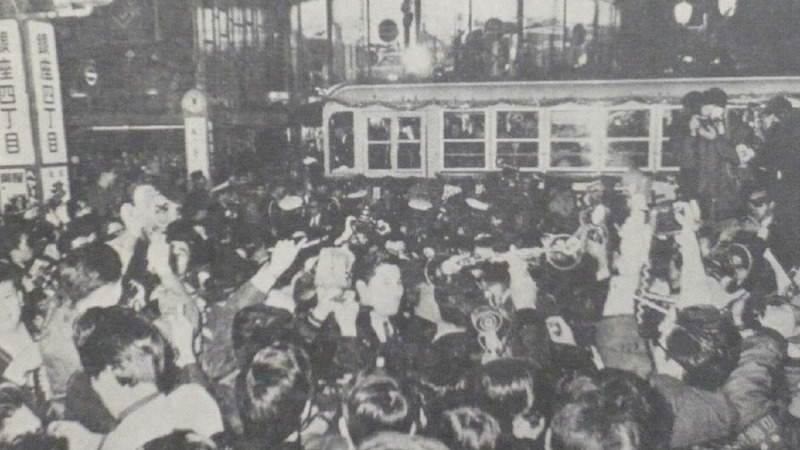 On the night of December 9, the final night of the Toden streetcars, throngs of people filled Ginza-dori to reluctantly bid farewell to their beloved trams. The Yurakucho Line Ginza 1-Chome station opened in 1974, so that a total of 5 subway lines cross through Ginza. Today it has become a subway district, with as many as 155 million people passengers each year. The area between the 50 meter wide moat that was filled and the Tsukiji river further to the left that flowed eastward was called Kobiki-cho. When Tokugawa Ieyasu rebuilt Edo castle, he housed the Kobiki shokunin, or “sawyers,” in that area, thus earning it the name “Kobiki-cho,” meaning “sawyer-town.” However, in 1951, the name of Ginza’s neighboring town of Kobiki-cho was changed to Ginza-higashi (east Ginza). In addition to the Ginza from prior to the war, there was also a Ginza-nishi (west Ginza). In 1968, Ginza-nishi became “Ginza”, and the following year Ginza-higashi also became “Ginza.” Although Ginza thus fused into one large district, triggering the start of organizations like the Zen-Ginza-kai (= “Ginza association”), the vestiges of the past district names remain, used in classification of neighborhoods associations. In addition, the shrines for each area are still divided so that Ginza-nishi and Ginza people visit Hie Shrine, and Kobiki-cho people visit Teppo-zu Inari Shrine. The Construction Ministry took the shutting down of the trams as an opportunity for major renovations of Ginza -dori. The main idea was to remove accessories from the street as much as possible and create a modern road that was well-suited for the coming car-oriented society. The year of 1968, the year the plans were completed, also marked 100 years after the start of the Meiji era. In Ginza, which had played an important role in the development of modern Japan with the building of the Meiji Bricktown, the “Meiji 100 Year Anniversary Grand Ginza Festival” was held in October of that year. 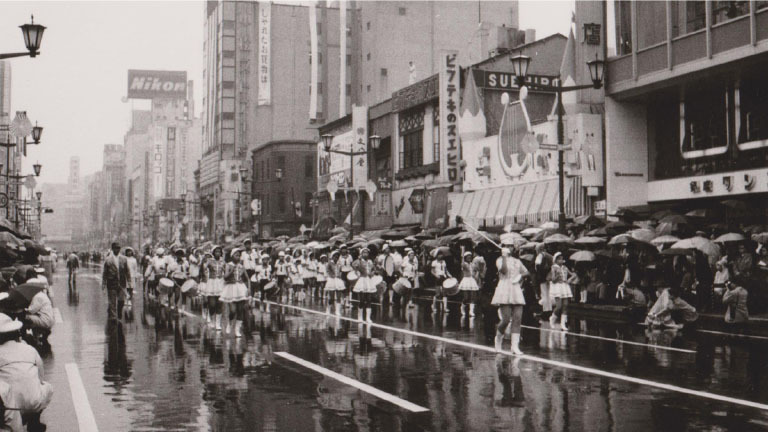 The extremely glamorous festival, during which the district was colorfully decorated and light-covered cars drove in a parade down Ginza -dori, became a major Ginza event, and continued to be held annually with various themes each year until 1999. On August 2, 1970, Ginza -dori was closed to traffic to become a pedestrian paradise for the first time. The pedestrian paradise was called a “Holiday Promenade,” and the name was thereafter used to call the first Sunday in August a “Holiday Promenade,” during which events are held each year. The pedestrian paradise has become completely established as the rule for Ginza on holidays. In the beginning, a pedestrian promenade was also created in Shinjuku, Ikebukuro and Asakusa, but Ginza is currently the only district to continue this custom. It was 1956 when the Economic White Paper stated that “The postwar period is over.” Japan’s economic growth following the war sped forward so fast that Japan went on to hold the Tokyo Olympics in 1964 and was determined to have the second largest GNP in the world in 1969. Spurred by that success, Ginza was vastly transformed during the period from the mid-50′s to the mid-60′s, with the filling of the moats, building of highways, expansion of the subway system, removal of the trams, renovation of Ginza-dori, launching of new festivals, and much more. Wooden buildings constructed right after the war were replaced one by one with larger stone and concrete buildings. In 1966, the completion of the Sony Building at the Sukiyabashi intersection was the start of high profile buildings popping up one after another, including the Sannai Building on the 4-Chome intersection, the Toshiba Building that is the largest building in Ginza, the Ginza Lion Building, Ginza Boeki Building(Meitetsu Melsa), Shiseido The Ginza, and more. Then, the prosperity came to a standstill in 1973 when the Oil Crisis struck. As a result of the Fourth Middle Eastern War, oil prices rose, production was cut and supplies were restricted. The Japanese government responded by cutting oil and power by 10% and proposing restraint from using private vehicles, which drove housewives streaming to the shops to stock up on toilet paper and other necessities. The Ginza department stores reduced their opening hours and the neon signs that had come to symbolize the entertainment district flickered out. The Ginza Street Association lobbied the government to ease restrictions on the neon signs. 8.Strive to build an even more personal district strengthening Ginza and adjacent area’s habitability. Following the Oil Crisis, the economy once again rebounded, and an unparalleled economic boom began around the mid-’80s, referred to as the “Bubble Economy.” While Ginza also saw its fair share of large money exchanges, successions of glamorous parties and long lines of people waiting for taxis, the real change was taking place elsewhere — it was during this time that a number of financial institutions opened branches on Ginza-dori. Looking back across history, the establishments that thrived the most at the time opened shops on Ginza-dori. For example, during the Meiji Bricktown period, it was shops selling western goods, and during the early Showa period, it was cafés. Similarly, numerous banks, brokerage houses and other financial institutions opened branches along Ginza-dori during the years of the asset-inflated “Bubble Economy.” Financial institutions are not places to enjoy shopping. Moreover, at 3 o-clock, which is when most visitors to Ginza are still out shopping, they are already closing. This situation was less than ideal from the viewpoint of creating a bustling district. Not only that, but the already high land prices in Ginza skyrocketed even further, actually stopping buying and selling activities. During this period, parts of other districts were frequently bought up by land sharks, transforming those districts, but this did not happen to a large scale in Ginza. Following the bubble’s implosion, the economy grew stagnant. With absolutely no prospects in sight for recovery, landowners in Ginza had great difficulty paying taxes on the extremely high land prices. People who did not invest in the land with the aim of making money, but rather to protect the land they inherited from their ancestors, had to pay property taxes, inheritance taxes and other taxes due to land appraisal that was completely unrelated to their own business. Regulations at the time decreed that the gross floor area of buildings being rebuilt must be smaller than that of initial construction , which prevented rebuilding of buildings constructed soon after the end of the war and led them to become decrepit. In 1995, the people of Ginza including those who belonged to the Ginza Street Association began lobbying the Chuo Ward administration, City of Tokyo and the Construction Ministry to make the floor area ratio on par with that of Marunouchi. Drawing on that concept, the Construction Ministry set up a system called “Function Update Intensive Land Use Districts.” District planning of Ginza was established based on that system and under negotiation with Chuo Ward. 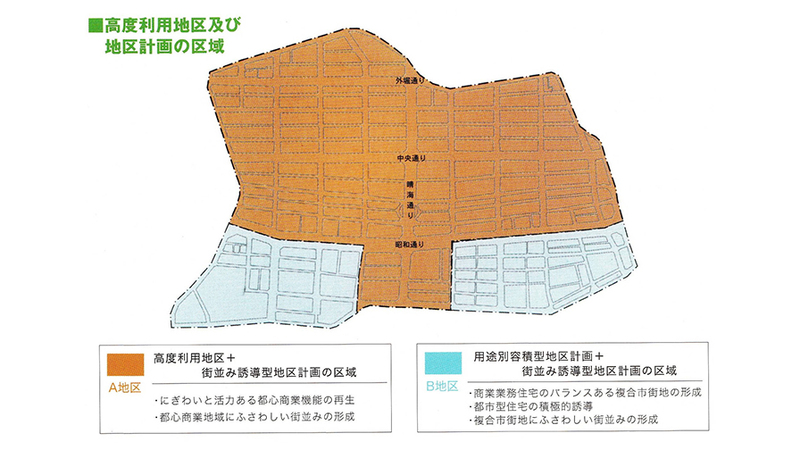 The Ginza map is designated by ordinance to have two types of district planning sectors. The maximum building height is 56 m for both. The basic framework for Ginza was defined by the district planning “Ginza Rules,” and the Ginza Street Association formulated a “Vision for Urban Planning in Ginza” to summarize the underlying concepts. This was part of a project to commemorate the 80th anniversary of the Ginza Street Association’s founding. The Vision proposed 3 main objectives for urban planning. The first was to reclaim the waterfront and revitalize the alleyways. Since the Edo era, Ginza had been a waterfront district encompassed by canals and rivers. Also, the streets set up in a grid-like system were dissected by an extensive network of alleyways in which people lived vibrant lives. Then, the waterfront was swept away in the waves of motorization and the alleyways began to disappear as the buildings got larger and larger. In light of this history, the Vision proposed urban planning that facilitates the co-existence of old and new, for example by creating an environment that is rich in water and greenery and by redefining the alleyways to create places for people to comfortably rest and relax. The second objective was to plan a new type of “Gin-bura.” Ginza is a fun district to walk in that is embodied by the phrase “Gin-bura.” The aim of urban planning thus became reconsidering the district from the chief viewpoint of walking, considering points to make it barrier free, having each street present its own unique style to provide places for exciting encounters, and creating a beautiful scenery. It also included the creation of systems to remove street-parking and consideration of public transportation systems such as a “Park & Ride” shuttle bus service and LRT (Light Rail Transit) to eliminate vehicular traffic throughout the district. The third philosophy was to create new Ginza culture. Although Ginza is primarily a shopping district, districts do not develop through the economy alone. If anything, Ginza’s history has been marked with unique culture that has developed in tune with each era, and that was what supported the development of the district. The Vision proposed creating systems that would produce momentum for cultural creativity by providing young artists a place to work and facilitating the emergence of new socio-cultural value and the transmission of information. In the fall of 1999, the 32nd Grand Ginza Festival was the last of its kind that had been held annually since 1968. 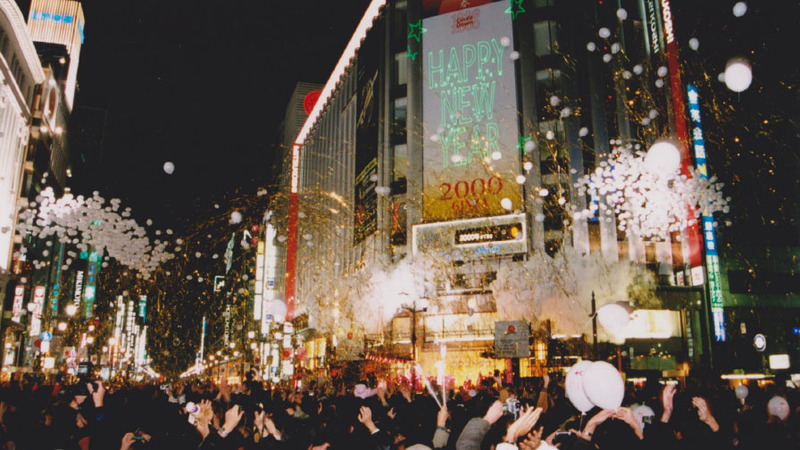 On December 31 of that year, a massive “Countdown to 2000″ was held on the Ginza 4-Chome intersection. No festival was held in fall 2000, and the All Ginza Event Executive Committee was established, thereafter spending many days deliberating what would be the most appropriate Ginza festival for the new 21st century. A countdown was held on the Ginza 4-Chome intersection on December 31, 1999. 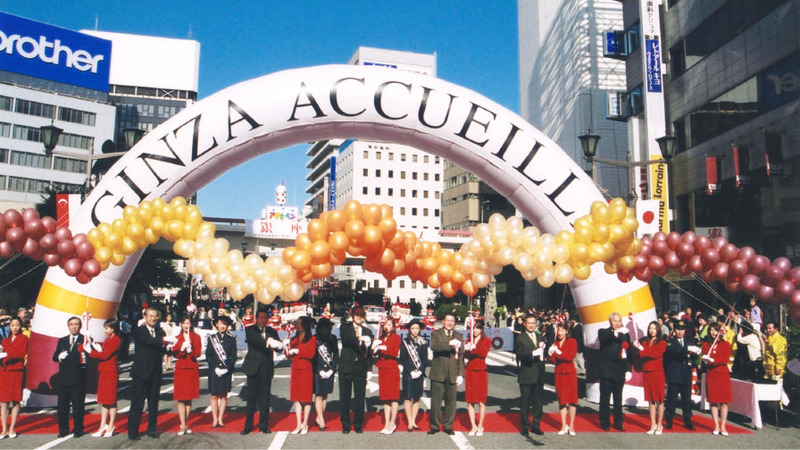 An event to commemorate the conclusion of a free-trade agreement between Japan and Singapore was taken as an opportunity to hold Ginza Accueille in 2001 as a new Ginza festival. In the Grand Ginza Festival of the past, planning and running the event was delegated to advertising agencies. In contrast, the new festival was devised and created by hand by the people of Ginza. The event, in which Ginza vigorously came together as one united district, triggered the dissolution of the Ginza Liaison Council comprised of the 23 block associations, street associations, merchant’s associations, cooperatives, trade associations, and private groups in Ginza’s 8 block divisions, in favor of forming a new Zen-Ginza-kai (= “Ginza association”). Whereas the Ginza Liaison Council was only a liaison for reporting and information exchange, the new Ginza Association that was created is an official organization with a code of practice and executive officers who are elected to the board. It is a more in-depth decision-making body for the entire district of Ginza that carries out events, urban planning and other activities and requires membership fees for operation. In 2003, large-scale plans were set to develop skyscrapers along Ginza-dori. According to the District planning “Ginza Rules” defined only recently, the maximum height of buildings along Ginza-dori was set to 56 meters. The people were astounded and puzzled as to how skyscrapers were allowable. The answer was in the Act on Special Measures concerning Urban Renaissance that had been established in 2001. As long as development was based on this act, large-scale plans in certain areas defined as “special areas” were allowed to proceed that transcended the rules of that area. Ginza was defined as an Area for Urgent Development of Urban Renaissance, and the district planning “Ginza Rules” included a clause that its rules did not apply to projects in special areas. There were other large development plans in the works, for example for Mitsukoshi and the Kabuki-za Theater. Also during this time, the Ginza Association that was founded in 2001 gradually began to take shape and form a system for considering the entire Ginza district as a whole, and various challenges for urban planning arose. Momentum was accelerating for considering not only building rules and measures to deal with the problem of large-scale development, but also challenges for the entire district, such as public order and the landscape throughout Ginza. 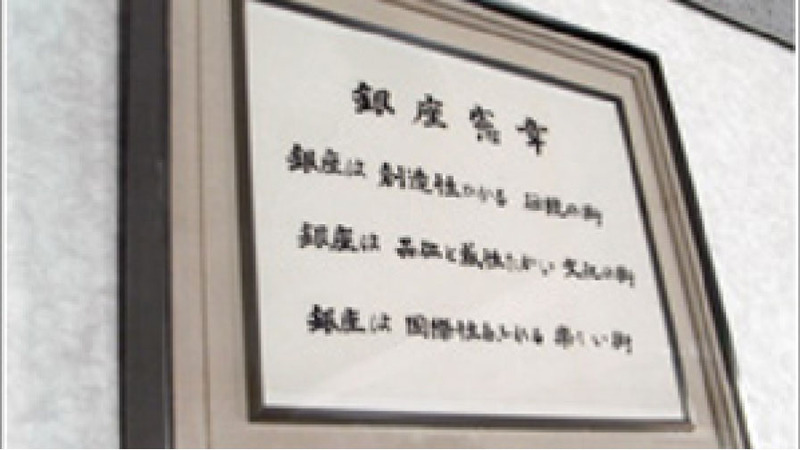 Thus the Ginza Machidukuri Council (machidukuri meaning “urban planning”) was established as a point of contact for development as well as a vehicle for considering challenges of the entire Ginza district, with the help of specialists. 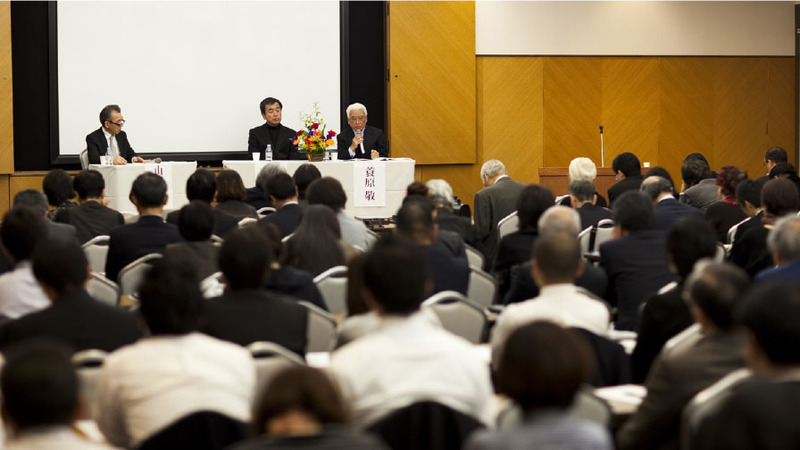 The Ginza Machidukuri Council held a stream of symposiums asking the opinions of specialists while simultaneously providing a chance for the people of Ginza to speak their mind. It also visited the block associations and street associations, holding study sessions and putting opinions together. Meetings also began with Chuo Ward to reconsider the district planning “Ginza Rules,” and they were finally revised after a year and a half of persistent talks. The main point of the revision was that the maximum height of buildings in the Ginza district would be 56 meters (66 meters including the structures), regardless of whether in a special area. As the land use in Area A shown in the map is different, an exception to this rule could be made in this area for plans that contribute to the preservation and/or succession of culture. While this was a step in the right direction, merely defining the maximum building height did not have any bearing on whether the dignified and refined Ginza-style landscape would be preserved. The concept of “Ginza-style” that cannot be defined by numbers or words has been largely fostered through actual face-to-face relationships among peers through frequent Ginza Association meetings, street or block association meetings and co-hosted events and preserved through the efforts of the community. As the global economy progresses, it will become difficult to maintain Ginza’s distinctive style if there is an increase in unknown business operators that raise buildings in neighboring areas unnoticed, do not share information, and carry out their own business without taking part in district activities. The people of Ginza once again met with Chuo Ward and a Ginza Design Council was established. This Council ruled that any business establishments planning to raise a building over a certain size or a structure that requires an application for building confirmation must hold preliminary talks with the locality before submitting the application or urban plan draft. The Ginza Design Council that was created is officially designated by Chuo Ward and holds preliminary talks with developers that cover points which cannot be measured, such as building design, color, harmony with the streetscape, and contents of advertisements, to determine whether or not Ginza’s style will be lost or whether or not the project will improve Ginza somehow. Projects that receive the go-ahead are reported to Chuo Ward. While there is no legally-binding authority, projects that are not so reported cannot move ahead in the procedure. 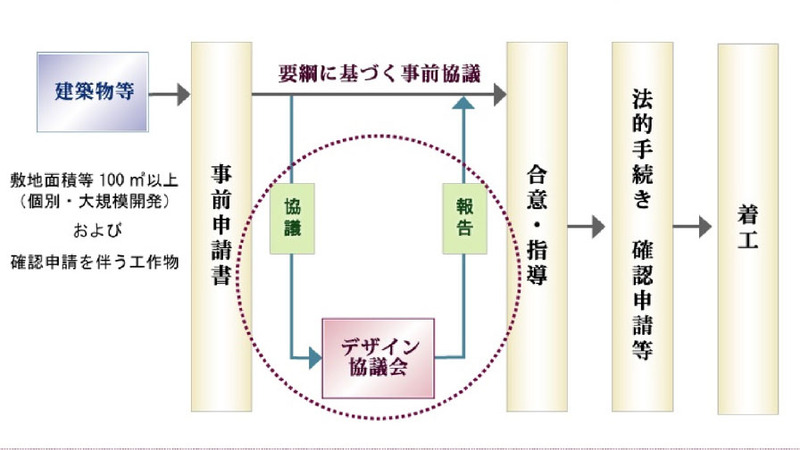 In addition, Chuo Ward considers those reports when advising the developers. Through this system, nearly all new business operators come to see the Ginza Design Council, enabling the Council to collect information and act as a liaison for face-to-face interactions with the locality. Underlying this process of urban planning and the system that is built is something that has passed down unbroken over the years, known as the “Ginza Filter.” The Ginza Filter is not a written code or rule, but rather a refined unwritten gentleman’s agreement that separates what is befitting of Ginza from what is not. The people of Ginza believe that, even without defining rules in words and numbers, that which does not fit Ginza passes through this invisible filter and disappears naturally, leaving behind only that which fits Ginza. To ensure that the people of Ginza share this common awareness, it is necessary to consistently hold dialogues and maintain communication on individual incidents and decisions. By doing so, the people of Ginza maintain the Ginza Filter. As the economy becomes more and more globalized, however, a need is gradually rising to put the filter into words. 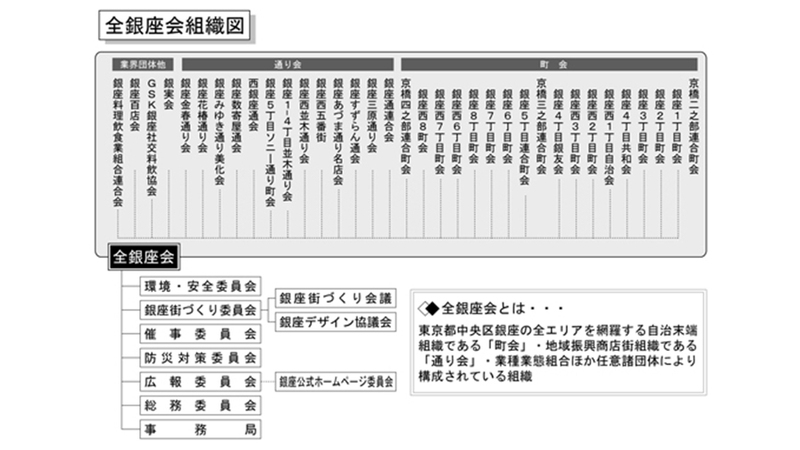 Organization of the Design Council System specified by the Chuo Ward Urban Area Development Project Guidelines. Procedures cannot move forward unless approval is received from the Design Council designated by the ward mayor. In 2004, the Ginza Accueille festival was renamed to Promenade Ginza, and its events were given a more cultural focus. It was also transformed into a project that linked to promotion of sales, which is more befitting of Ginza as a commercial district. Although the　themes for Ginza Accueille and Promenade Ginza are “hospitality” and “strolling through Ginza,” respectively, the events for both are designed to display the uniqueness of Ginza. However, both concepts are now to be pursued by the Ginza district not only during the event period, but throughout the entire year. Rather than a few large events a year, it was thought that better to hold many smaller scale events dispersed throughout the year that focus on Ginza’s unique culture to attract visitors and allowing them to enjoy touring the shops and restaurants. With this concept in mind, the fall events were renamed “Autumn Ginza,” and, instead of focusing all events in the fall season, some events were moved to spring and summer. 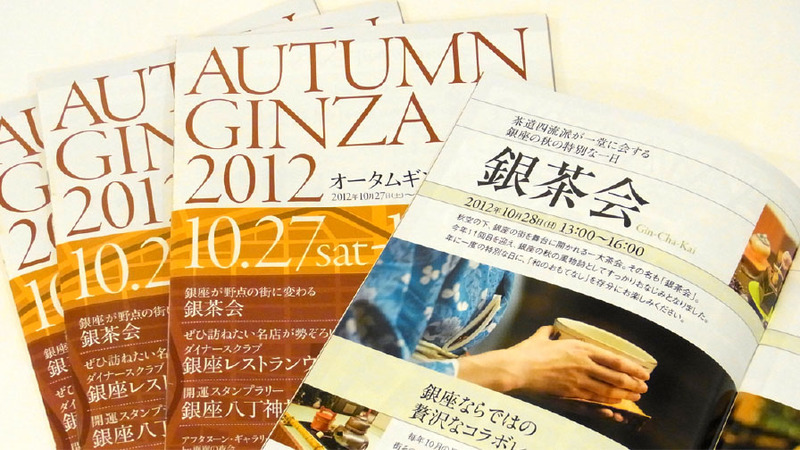 As of 2012, Autumn Ginza events include a “Gin-cha-kai” (Ginza tea ceremony), Ginza Restaurant Week, Ginza 8 Block Shrine Tour, Garonoyakai (night gallery tours), Ginza Design Forum, and more. Another major event put on by the Ginza Association is the Holiday Promenade. 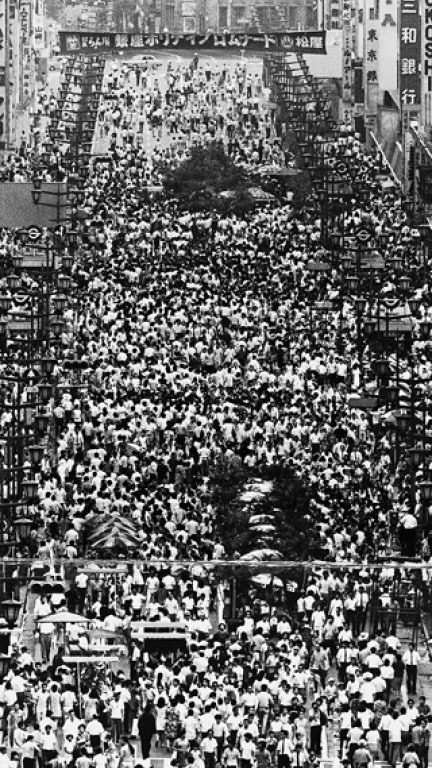 As mentioned above, ever since the first pedestrian paradise was held in 1970, events have been put on annually on the first Sunday in August. 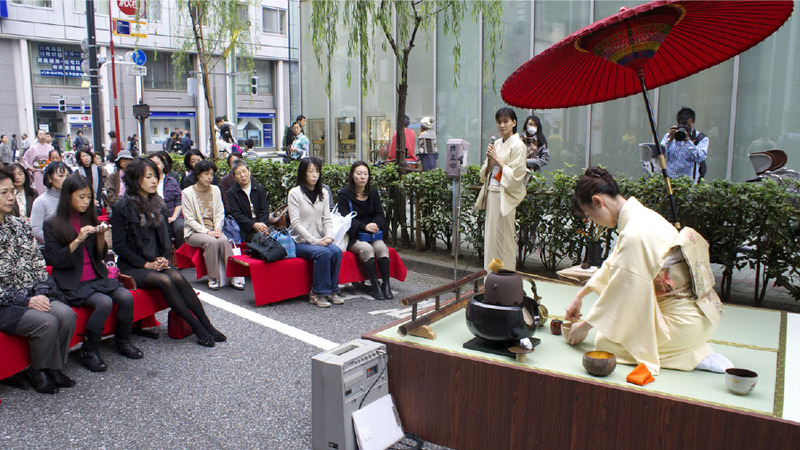 The types of events were revamped in 2007, and all of Ginza was given a summery appearance based on the theme of “Yukata de Gin-bura” (strolling through Ginza in a yukata). The festival included a jumbo raffle for visitors dressed in yukata to win prizes and loads of special services from the various shops. An “Uchimizu” event hosted by the Ministry of Land, Infrastructure, Transport and Tourism called the “1000 Person Cool Breeze Project in Ginza” involves a long line of people dressed in yukata splashing water on the street in unison. Each street association also puts on their own fun events, such as the Ginza Willow Festival on Nishi-Ginza-dori (May 5), the Konparu Festival on Konparu-dori (mid-August), the Ginza Suzuran Festival on Ginza Suzuran-dori, and night cruises held by the Namiki-dori Street Association. One after another of the banks and brokerage houses that had lined Ginza-dori during the bubble economy became consolidated or had its branch closed, and the vacancies were eventually filled with stores from foreign brands in the late ’90s. Once again, Ginza became lively and colorful. The Ginza Street Association founded a Ginza International Luxury Committee (GILC) in 2001 that shared information among business people in the same area. As of 2012, GILC currently has 13 companies as its members. 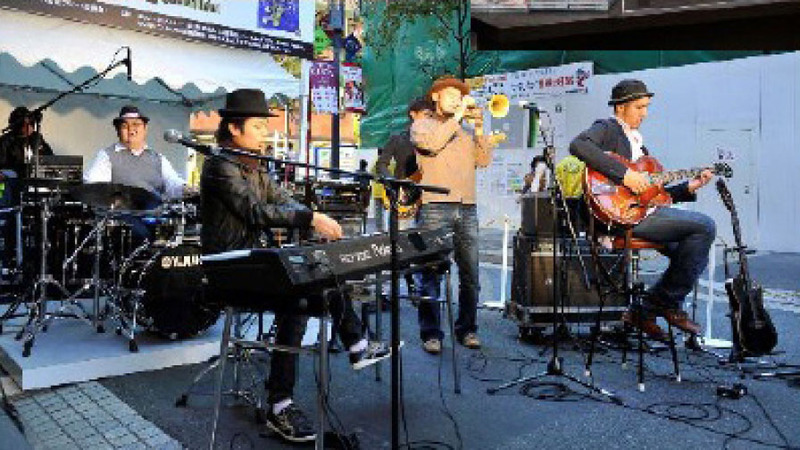 Under the theme of “How do foreign brands cooperate with each other to revitalize Ginza,” GILC proposes and holds various events, such as the Ginza Jazz Festival (2005-2010). 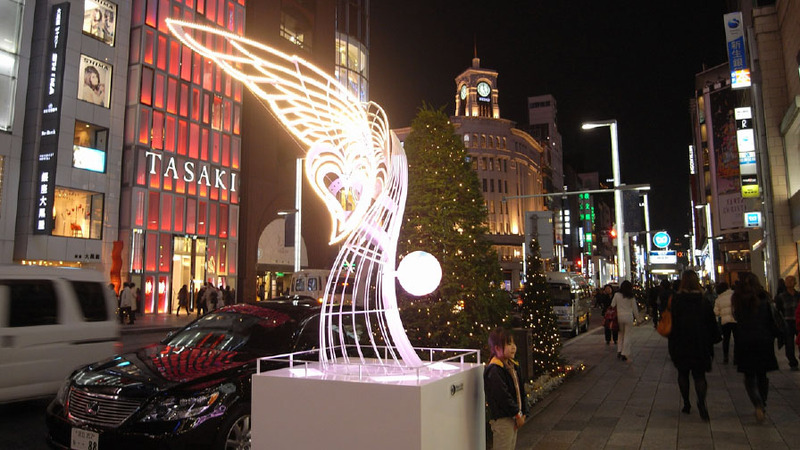 It is currently responsible for planning and executing the Christmas illumination project that brilliantly colors Ginza-dori each year during the holiday period. Ginza was very quick to emphasize publishing information on the Internet. Now, each district and area has its own Website, and it is normal for districts to publish information through them, but Ginza launched its official Website, “Ginza Concierge,” as early as 1996. Ginza Concierge was renamed “Ginza Official” in 2011 and redesigned so that it not only introduces shops and events, but also publishes stories and thoughts on business and on Ginza itself from people running businesses in the district. It thus more strongly conveys the charm of Ginza. In an aim to globalize its information output, the site is now available in both English and Chinese as well. The Ginza Design Council that was inaugurated in 2006 has come to receive roughly 100 applications for new buildings or structures a year. Even businesses with projects that do not require application are voluntarily coming to report to the Ginza Design Council more and more. Most of the businesses listen to the opinions of the Ginza locality and cooperate with them to further improve proposed design. When it comes to large-scale development projects, the developers exchange opinions with the Council from the planning stages, and confer with the Council on the way in which the project should contribute to the area in that which is only possible with large-scale projects. Initially, the Ginza Design Council did not define any rules such as on the brightness or saturation of colors or on the size of advertisements that would act as general design guidelines. It only had criteria for judging what is befitting of Ginza. Unfortunately, this was often inconvenient for businesses. 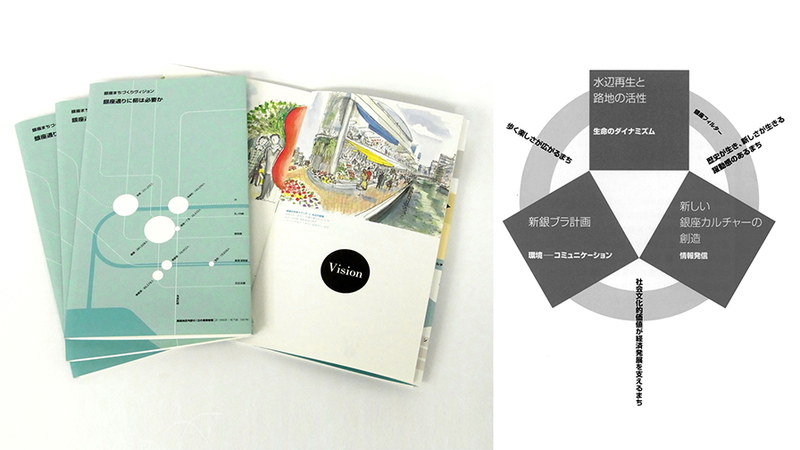 In 2008, a little more than a year after the Council was established, it prepared a pamphlet laying down “Ginza Design Rules.” The pamphlet described the history of urban planning in Ginza, detailed the district planning “Ginza Rules,” explained the organization of the Ginza Association, and provided a number of case examples from previous consultations. Ginza, whose main principle is to be consistently progressive while continuously evolving dispelled with the notion of fixed rules. Instead, it embraced the concept that rules mature through the accumulation of experience and cases and that the rules themselves must be reviewed and revised for each creative new project proposal. 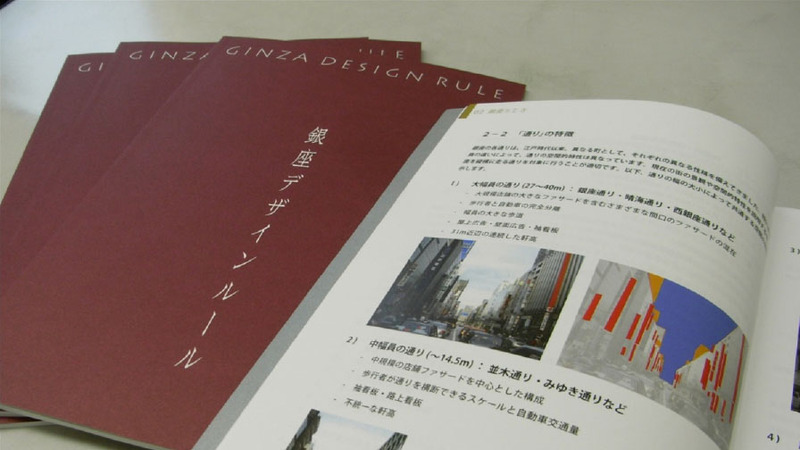 After further working through a number of projects, the Council published the second edition of the Ginza Design Rules at the end of 2011. Entering the 21st century, plans began for several large development projects on a scale unseen of in Ginza until then. Mitsukoshi that faces the Ginza 4-Chome intersection expanded and merged with the East side block. Ginza’s block organization is very historical, having been created by Tokugawa Ieyasu and overhauled during the construction of the Meiji Bricktown. The human scale feature of Ginza formed in the years when people walked the streets while carrying on their daily lives there, can be considered essential to Gin-bura. Although Mitsukoshi reconstructed the road between the blocks, it preserved its walk-through function. In addition, Ginza held numerous talks with Mitsukoshi and Chuo Ward and decided on an urban project that would not destroy the passages between the blocks even in the future. Ginza Komatsu on Ginza 6-Chome did not link any blocks, but is linking the building with its West tower through passageways. In line with the new district planning “Ginza Rules,” the Kabuki-za Theater will keep its facade in the design of the previous building, but build a super-high rise office building behind it. It is maintaining discussions to determine how to preserve the Kobiki-cho culture of rows of theaters from the Edo period, while conveying the culture of the region as a whole. Construction is scheduled to be completed in spring 2013. Other large-scale development plans are also in the works for the future, such as a 6-Chome project that uses the Tokyu TS building and 2 blocks along Ginza-dori. While there is thus a trend towards larger buildings and collaborations, the plans are designed to open projects on the streets that add to their liveliness and to the enjoyment of Gin-bura, and contribute to the area in the form of bicycle and large bus parking lots, rooftop gardens, and other features that are not possible with small-scale development. Meanwhile, a recent characteristic of Ginza is the advance of fast fashion brands. In every era, Ginza has always been the district where the most thriving businesses of the day open shops or branches. Ginza places high expectations on these shops to breathe the air of a new era into the district. As the shop is opening in Ginza, it was also expected to become a true member of the district, and carry on business that befits the Ginza style. It should then pass through the Ginza filter and bring in new Ginza fans. These are the hopes of the district, and how Ginza has built up its history over the years. Throughout every era, Ginza-dori has remained a symbol of Ginza. Many facilities have deteriorated since the major repairs that were made in 1968, and plans are being considered to revise facilities to fit the new era. The original concept of the 1968 repairs was chiefly centered on keeping up with the era of motorization, but the times have changed, and the new era is calling for development of a beautiful streetscape, a rich environment that is earth and people friendly, and streets that are enjoyable to stroll through. In 2004, road pavement construction was completed as thermal insulation against the heat island effect and as a noise prevention measure. The granite sidewalk paving stones were also repaired. In 2003, as one part of a project to commemorate the 400th anniversary of the start of the Edo period, the short Indian Hawthorn shrubs were removed and replaced by flowerbeds. They were later replaced with mid-sized Japanese yew trees. 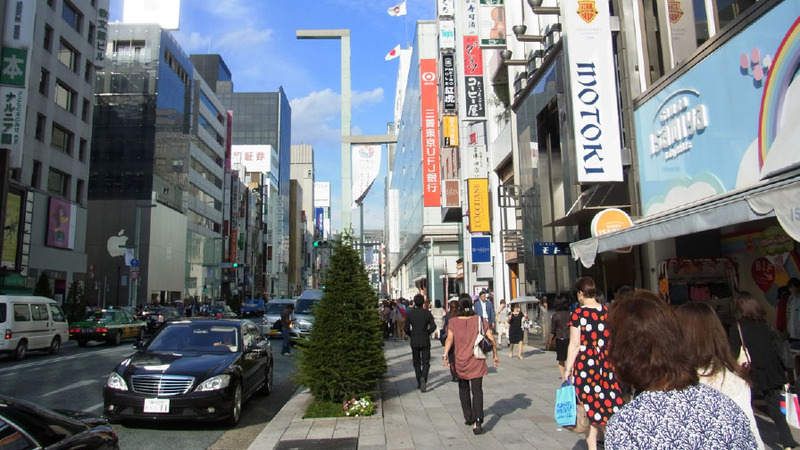 The yew trees were actually planted as an experiment with mid-sized trees while considering candidates for the future street side trees in Ginza. Discussions still continue with the Ministry of Land, Infrastructure, Transport and Tourism to select the best street side trees for Ginza. In 2006, the Ministry held an international competition for the design of the street lights. The design of Jun Matsui was selected from among 280 entries from 18 countries around the world. The street lights were rebuilt with the new design that incorporates the latest technologies and uses LED lights that consume less power and require minimal maintenance. Security cameras were also installed to increase the safety of the district. In 2012, a Wi-Fi system was set up along Ginza-dori, making the street even easier for visitors from Japan and abroad to enjoy. Since the beginning of the 21st century, the advance of the global economy and information technology has brought tremendous change to the world. Ginza has made significant changes as well, including the establishment of the Ginza Association, revision of festivals and events, founding of the Ginza Machidukuri Council and the Ginza Design Council, and overhaul of Ginza-dori. In the midst of all this, new challenges have arisen, and the need has come to develop a vision of what Ginza’s future should entail. Addressing the declining birthrate and aging and shrinking of the population as well as environment-related challenges is a critical topic for all districts. Ginza also has its own unique issues, such as changes in its consumption structure due to the increasing number of residents in surrounding areas (not visitors from the suburbs, but residents in neighboring areas who come to shop in Ginza; a change from corporate expense accounts to private spending), and the accompanying changes in views on public transportation that are also being considered from an environmental stance. Addressing visitors from not only Japan but also overseas must also be a topic of focus from the perspective of international tourism. The district planning “Ginza Rules” are centered on guiding commercial enterprises, but Ginza is not founded on business alone. Historically, shops in Ginza usually had a lower floor for running the business and an upper floor where the family resided. Also, the upper floors of larger buildings held many offices, and the people who worked there also contributed to consumption in Ginza. Aiming towards development of a sustainable district for the future, use of the district must again be reconsidered and revised to an area that has a mix of living (residences) and working (offices).